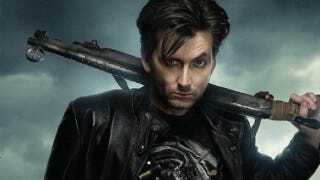 See what the vampire-hunting David Tennant looks like, sans ridiculous wig and silly Las Vegas magician get up. It's not looking good for Collin Farrell's evil vampire. Check out the new Fright Night character posters now! To view more Fright Night posters, head over to Empire. Fright Night will be out September 2nd.